Okay, try and keep this straight: Dodge was producing pickup trucks since before the war. In 1948, they introduced the B-Series range of trucks. In 1954 came the C-Series. The D-Series didn’t come until 1961. But during the C-Series years, Dodge took a page from Ford’s naming conventions book and introduced the D100 as their 1/2 ton model. The C-Series was the name for the range, but the D100 was the name for the model. So, with that, we look to the fancy, late-1950s finned pickup bed. It’s kind of cool but it also looks like they hacked the trunk of a DeSoto and glued it to the back of a pickup cab. Glad to see Chrysler was utilizing the parts bin as far back as 1957, when the limited-edition Sweptside model was introduced. The truck was aimed at the Chevrolet Cameo – the star of the “I’m probably not gonna be hauling hogs in this truck” trim line at the time (yes, luxury, limited-edition style trucks have been around for a long time). It uses a 5.2-liter V-8 making 204 horsepower. It’s a pretty truck – which is likely the last thing a pickup driver wants to hear. Only 1,050 were built (presumably for 1957). It’s a “National First Place Winner” according to the lot description – no mention winner of what – but it’s certainly well done. Looking at auction history, look for it to bring between $60,000-$70,000 – but trucks have been hot lately so it could be a little more. Click here to read more and here for the rest of Barrett-Jackson’s Palm Beach lineup. 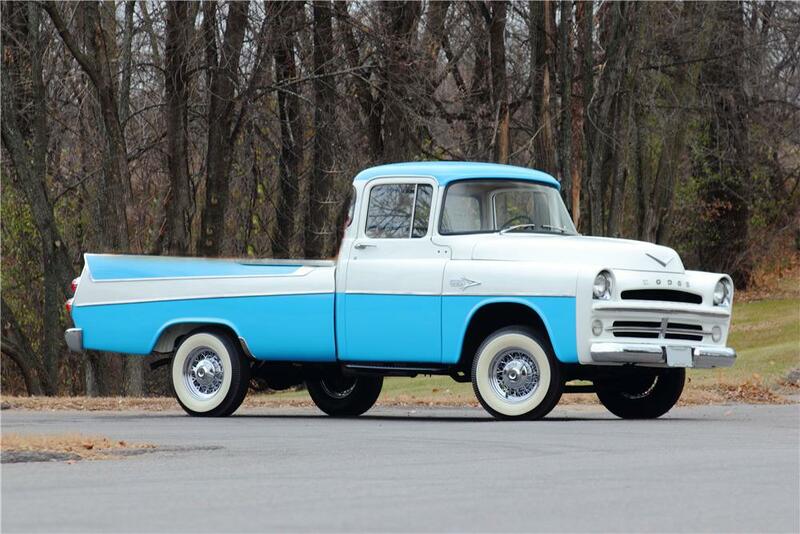 This entry was posted in Uncategorized and tagged 1957, auctions, barrett-jackson, cars, classic cars, d-100, dodge, pickup, sweptside by classiccarweekly. Bookmark the permalink.